In the garden of memory, in the palace of dreams, that is where you and I shall meet. Since my thyroid radiation in July, I’ve been struggling with still feeling like general crap. Fatigue and brain fog have been intermittently worse. A pretty leisurely two-mile walk with Rango and the boys recently wiped me out for two days. My bloodwork shows wildly-swinging levels of thyroid hormones, indicating that the regrown tissue is indeed dying off, though it may be months before it normalizes. With that has also come more weight regain and self-recrimination and outright self-loathing. I have tried to get back into the gym even semi-regularly. It’s hard enough to juggle work and school and kids successfully, and trying to find even six hours a week for myself in that is sometimes unmanageable. Of course I know the exercise will actually help me to feel better, but the fatigue that comes with hypothyroidism can be unimaginably oppressive. Recently I started a series of virtual races through Yes.Fit. Of course I chose the Alice in Wonderland themed races. After I complete so many miles, as tracked by my Misfit activity tracker, my medal is sent to me automatically. As of today, I’ve completed three of the six Alice races, totaling more than 60 miles. As it does every day, Facebook was kind enough to remind me this morning of memories from this day in previous years. I find it interesting to see how life has changed over the last few years, but I tend to face those reminders with some trepidation. I love the pictures and funny quotes from my boys from their younger days. Sometimes the memories are useless or now meaningless, or sometimes even too painful, and I’ll delete them. Sometimes I leave the painful ones, knowing those ghosts will haunt me again next year, because I’m either not ready to deal with them or I know they’re so important that I will need the reminders again. But today, there were two things, from 2010 and 2011. Not surprising, there were pictures from a 2010 concert, of a band I loved then and love now. It was the second in a series of shows that were seminal for the changes that would come over the following two years. A year later, it was the memory that was down 99 of the 115 pounds in total weight loss. Yet another year later, I’d just separated from my now-ex-husband. All of that has fueled my writing since 2010, which began with the realization that I’d lost my muchness--just like Alice in Wonderland. I have said repeatedly over the last year that, for a variety of reasons, I felt like I was back in 2010 and didn’t know why I was reliving such similar circumstances. Regardless of the logistical changes and strides I know I have made, I have replayed the past in tandem with the present and come up with only confusion and emotional failure. I have continually grappled with figuring out which choice I didn’t make or should’ve made differently. I’ve tried to re-learn whatever lesson I obviously needed to repeat. But somehow, I keep sliding farther and farther into the past. Where 2010 may have felt like a rabbit hole, 2016 is feeling more and more like the other side of a looking glass. Where then felt new and exciting and rebellious, now feels reflective and reversed and exhausting. What is it? What did I miss? What do I need now that can only be retrieved from then? 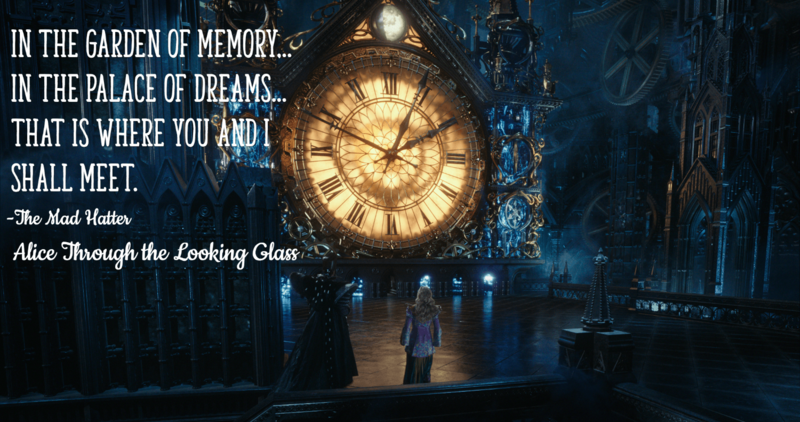 It just so happens that Alice Through the Looking Glass comes out on DVD this week. Of course I saw it in the theater when it opened--how could I not?--but I really didn’t love it as much as I did the first one. It was beautiful, and I looked for the clues to my missing lessons, but the torment of Time was unsettling to me. I could willingly believe in a lost young woman traveling to surreal place and conquering her fears, but it was almost impossible for me to suspend my disbelief as the same woman mended old wounds. But maybe that’s it. Maybe my path has been a big circle, and maybe the obstacle is an unturned stone. Certainly I can pinpoint errors and mistakes and regrettable decisions, but I feel like I have done everything in my power to apologize and make amends for those actions. I would say I have done my best to move on, but I damn well know there are frozen moments that continue to haunt me. I don’t know what it is, but there is something. It is maddening, appearing and disappearing, always just out of my reach. So I’m starting back at the beginning, at Alice. I am literally retracing my steps, one foot in front of the other, until I can find a way to the next landmark on this destination. I don’t want to believe that I am personally destined to repeat the same mistakes over and over, that there is literally no way to avoid spiritual repetition. I’ve already seen the White Rabbit, I just passed the Cheshire Cat and am making my way toward the Mad Hatter. There is still the Caterpillar and the Queen of Hearts. After that, I’m seriously considering the Pac-Man races, where I get to eat a series of brightly-colored ghosts. The idea of having the sentence first! 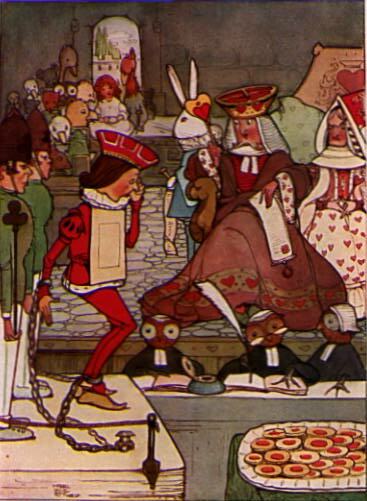 Near the end of Alice's Adventures in Wonderland, Alice is in the gallery for the trial of the Knave, who is accused of stealing tarts from the Queen of Hearts. It's a sham of a trial--even young Alice can see the ridiculousness of the process--where witnesses and the King, acting as judge, talk in circles and silly expressions. The Queen wants a sentence before there's even a verdict; she wants someone's, anyone's, head to be off, of course. Alice wants the trial to be over, so they can move on to refreshments. The last piece of evidence to be presented is a note, a series of nonsensical verses found in the Knave's prison cell. The Knave claims he didn't write it, which he can prove because he didn't sign it. (If he didn't write it, of course, how did he know it was unsigned?) The King retorts that the Knave must be guilty because not having signed it means he was up to some mischief. The Queen and Alice argue over this supposed proof of guilt, and the King commands the White Rabbit to read the verses. "Begin at the beginning," the King said, very gravely, "and go on till you come to the end: then stop." I've been reading a lot about the process and art of writing as of late. I bought new copies of Rainer Maria Rilke's Letters to a Young Poet and Doris Lessing's The Golden Notebook. Recently I've read many, many great articles and blog posts from agents and editors and writers, about everything from finding an accurate voice for a period piece to finding the impetus to complete an unfinished piece. This idea of finishing what you've begun--of finding the inspiration to carry forward--is likely to be addressed at the onset of a new year, I suppose, but it's been especially poignant for me. I've talked before about being stuck in my fiction project, of not being sure how to proceed in the story. I spent some time rereading and reevaluating the flow and structure of the story. I enlisted the help of a dear friend to read the draft and give me some honest feedback. She agreed, thankfully, that the story had to continue down the path that I'd started. Another dear friend suggested that I jump ahead in the story, write the end and work backwards. It seems counterintuitive to me, but I know of several writers who do just that, especially if writing an emotionally difficult section. One said she wrote the happy ending and worked backwards so she always knew her characters would be okay. I can't do it that way. I need a working plan. I'm not so inflexible that I can't change the plan as I go along. For a project, I need an idea of where it's going and how I think I'll get there. When I started my fiction project, I had character sketches and story outlines, from a couple of different characters' perspectives. Interestingly (to me anyway) some of that changed. Characters took on attributes I hadn't intended or really imagined for them, and their stories were altered from what I had planned. Personally, I think the changes were for the better. Their paths diverged from the original map, and that's okay. I had to start at the beginning, even though I knew what was coming (or thought I did), and work straight through to the end. I can't jump back and forth in the story's timeline and have it make sense to me. I have to visualize the unfolding process these characters go through, to see them walking their cobblestoned paths, to get them to their happy endings. And then what? When they're happy and tucked safely away in their beds, what happens then? They have to stop. They have to come to their end and be finished. That's kind of a scary thought for me. That means the end of a lot of work and energy, hopefully with a new, diverging path of my own. Hopefully there will be a new flexible plan after this one comes to its own end. And isn't that what it's really all about, the going? "Go on till you come to the end." It's not "Go to the end." It's the getting from the beginning to the end that matters, the process of getting to a time and place where you can stop is what matters. As the adorable (and incredibly talented) Adam Taylor said to me once, "My father always taught me it's never about the destination.... It's all about the journey." I'm learning a lot about myself during this going, working on these projects. I've lost my breath when I saw myself in characters in ways I hadn't anticipated. I've been surprised by the baggage I have unpacked and finally been able to throw away. The destination, the finished stories, are the final stop for this project, but it doesn't mean anything if I don't get there. For me, it's one stepping stone at a time, from the beginning to the end.